Mercury is a naturally occurring element that is found in air, water and food. Most people are exposed to mercury via food. Fish take up mercury from streams and oceans as they feed. This mercury is in the more toxic, methylmercury form. It binds to a person’s tissue proteins (such as muscle). Food processing, preparation and cooking techniques don’t significantly reduce the amount of mercury in fish. Pregnant women – or, rather, their unborn babies – are at the greatest risk. Babies developing in the uterus (womb) seem to be most vulnerable to the effects of mercury on their nervous systems. The mercury may slow their development in the early years. Research is ongoing, but women should be selective about the kinds and amounts of fish they eat during pregnancy. Infants and young children should also be limited in the amount of fish with high levels of mercury that they eat. Before scientists became aware of the toxic effects of mercury it poisons the kidneys and nervous system—this seemingly magical metal was widely used in medicine, cosmetics, and industries like hatmaking. While mad hatters are a thing of the past, mercury exposure is now a serious and widespread health problem. Even small amounts of mercury can interfere with brain development, making exposure particularly risky for children younger than six and women in their childbearing years. The U.S. Environmental Protection Agency estimates conservatively that more than 75,000 babies are born each year with a greater risk of learning disabilities because of their mothers’ mercury exposure. NRDC puts that number as high as 265,000 newborns every year. But enough of the scary stuff. Here are a few easy ways to minimize exposure. Women who eat as much seafood as the FDA recommends for people who are pregnant or who eat slightly more may be exposing themselves to unsafe levels of mercury depending on the kinds of fish they’re eating, says a new study just published by the Environmental Working Group (EWG). The report calls for more detailed federal guidelines on what types of fish are safe, and in what quantities. But an industry group has already criticized the study. The National Fisheries Institute, a trade organization representing the seafood industry, released a statement Tuesday decrying the report’s “fear-mongering,” even as other academics supported its basic conclusions. Mercury contamination in the environment comes from a variety of sources, mainly industrial pollution. Mercury that makes it into water systems and eventually into the ocean can be consumed by small organisms and work its way up the food chain in larger and larger amounts, which is why it tends to exist in the highest levels in large, predatory fish often the kinds of fish that people like to eat, such as certain species of tuna. In previous decades, nutritionists have recommended that pregnant women abstain from seafood entirely to avoid exposing their developing babies to harmful mercury. But in the past decade or so, “we’ve seen the nutritional science shift to say that there are benefits to eating seafood,” said the new report’s lead author Sonya Lunder, a senior analyst at the EWG, a nonprofit environmental group with a long history of working on the mercury issue. The most widely touted of these benefits is the prevalence of omega-3 fatty acids, which are considered essential for human health but can’t be made naturally by the body. There are three types of omega-3s, two of which are found mainly in seafood. Research has suggested that consuming these omega-3s during pregnancy can aid in a fetus’s development, which is the major reason nutritionists now generally give pregnant women a complex recommendation: consume a moderate amount of seafood, adhering to certain federal guidelines to create a safe level of mercury exposure. In 2014, the FDA and EPA jointly released a new draft set of guidelines to aid in just that. 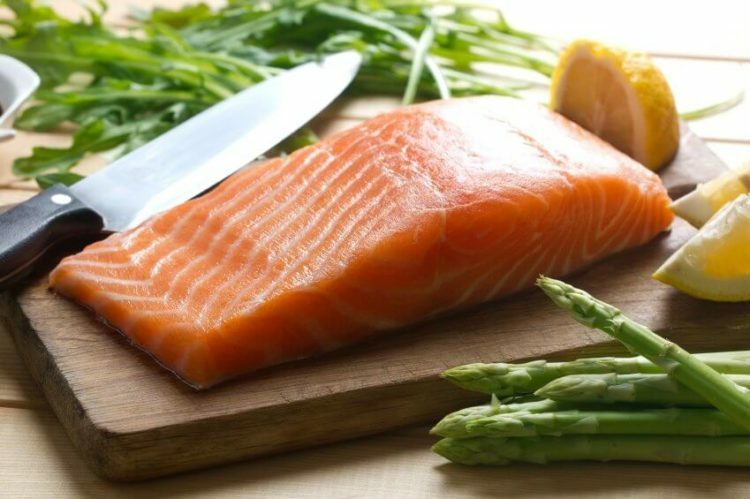 Overall, for pregnant women and some other groups, the guidelines recommend eating 8 to 12 ounces of a variety of fish each week, and list a number of healthy, low-mercury examples, including salmon, shrimp and light canned tuna, as well as four types of fish to avoid entirely: tilefish from the Gulf of Mexico, shark, swordfish and king mackerel. They also recommend limiting the consumption of albacore tuna to 6 ounces or less per week. But the EWG’s report suggests that may not be specific enough. A study of more than 250 women of childbearing age who ate approximately the amount of seafood recommended by the federal guidelines found that around 30 percent of them had higher mercury levels in their bodies than is considered safe by the EPA. On average, the participants were found to have mercury levels 11 times higher than those of a control group of women who ate seafood rarely or not at all (though the control group consisted of only 29 individuals). The results suggest that study participants may not be choosing the most optimal fish for low mercury and high omega-3 intake. The study estimated, for instance, that tuna accounted for about 40 percent of all the participants’ mercury intake — a result that may have been caused in part by the guidelines’ incomplete recommendations when it comes to tuna consumption, Lunder pointed out. The government recommends light canned tuna which is usually composed of skipjack tuna as a healthy seafood choice that’s low in mercury. However, canned tuna comes in many other varieties, some of which include different species with generally higher mercury concentrations. Canned white tuna, for instance, is usually made from albacore tuna, which can have mercury concentrations several times higher than skipjack. The importance of differentiating between the different types of canned tuna is not articulated in the guidelines. In fact, Lunder noted, when surveyed many of the study’s participants were unsure exactly what type of canned tuna they’d been eating. Additionally, participants reported eating many other forms of tuna, including tuna steaks and tuna sushi, which often are made from species with relatively high mercury contents. None of these are specifically addressed in the guidelines, either. Other experts agree that better information needs to be included in the guidelines — it just needs to be done carefully. For most people, the level of mercury absorbed by eating fish and shellfish is not a health concern. Overall, fish and shellfish are healthy foods. They contain high-quality protein and other essential nutrients, are low in saturated fat, and contain omega-3 fatty acids, a type of essential fatty acid. A balanced diet that includes fish and shellfish can contribute to heart health and children’s growth and development. Because of the mercury found in fish, Health Canada recommends that people eat limited amounts of fish high in mercury. If you are concerned about your or your child’s mercury level, talk to your doctor or local health unit about testing. Eating contaminated fish is the number one cause of mercury exposure in America. Mercury is spewed into the air from coal-burning power plants and factories. That pollution can travel halfway around the world and then settle into lakes, rivers, and oceans, where it is absorbed or ingested by small organisms and then starts working its way up the food chain, its concentration rising with each step. Big predatory fish, like sharks or tuna, can have especially high concentrations in their bodies. You can’t see, smell, or taste mercury contamination in fish. Cooking has no effect on it, and you can’t avoid it by cutting off the skin or other parts of the fish. But you don’t need to eliminate fish altogether to stay in the mercury safe zone. Below are a few general rules of thumb. Avoid a few key species. King mackerel, marlin, orange roughy, shark, swordfish, tilefish, ahi tuna, and bigeye tuna all contain high levels of mercury. Women who are pregnant or nursing or who plan to become pregnant within a year should avoid eating these fish. So should children younger than six. Ease up on tuna. Tuna is the most common source of mercury exposure in the country. If you or your kids regularly eat canned tuna, stick to light or skipjack tuna, and limit it to less than two servings a week. A 130-pound woman can eat almost two six-ounce cans of light tuna a week and stay within the EPA-recommended safe zone for mercury. A four- or five-year-old child should eat only about four ounces of light tuna per week. The rules change when it comes to albacore tuna. Children should avoid that fish altogether, and women of childbearing age should stick to no more than four ounces per week. Make safer sushi choices. Popular sushi fish are often the apex predators of the food chain, so they tend to be high in mercury. If you’re pregnant, nursing, or planning a family, you can reduce mercury exposure from sushi by holding back on all types of tuna, mackerel, sea bass, and yellowtail. Fish and shellfish like eel, salmon, crab, and clam are lower in mercury. When in doubt, smaller is better. Forgo the big predators and pick the little guys, like anchovies, sardines, and scallops, which are lower in mercury. Most people should not eat more than 150 g (5 oz) per week of fish that are known to have higher mercury levels. These include fresh or frozen tuna (not canned “light” tuna), shark, swordfish, marlin, orange roughy, and escolar. Some people need to restrict high-mercury fish even more. Health Canada has no restrictions on eating fish and shellfish that are lower in mercury. These include salmon, rainbow trout, pollock, herring, shrimp, mussels, clams, oysters, and canned “light” tuna. Mercury levels differ from one species of fish to the next. This is due to factors such as the type of fish, size, location, habitat, diet and age. Fish that are predatory (eat other fish) are large and at the top of the food chain, and so tend to contain more mercury. If you have concerns about your mercury consumption, ask your physician for a blood mercury test. Women with a high blood mercury level who are planning to start a family may decide to postpone pregnancy for a few months until that level drops. Mercury from most fish sold in Australia is not a health risk, when fish is consumed as part of a normal diet. However, for healthy adults (who are not pregnant) and older children (six years and over), fish with high levels of mercury should probably not be eaten more than once a week. Studies of the brain development of children whose mothers ate significant amounts of fish with high mercury levels during pregnancy have been carried out in New Zealand, the Faroe Islands and the Seychelles. The Joint Food and Agriculture Organization (FAO) and World Health Organization (WHO) Expert Committee on Food Additives (JECFA) reviewed these studies in June 2003. These researchers recommended reducing the amount of fish known to contain mercury in the diet, particularly for pregnant women. Australian research shows that mercury levels in some fish, particularly shark, could be even higher than in the areas studied for this research. In fact, it seems that mercury levels in some shark species caught in Victorian waters are particularly high. It is suggested that pregnant women eat 2–3 serves of fish every week for the good health of themselves and their developing baby. However, pregnant women or women intending to become pregnant within the next six months should be careful about which fish they eat. Some types of fish contain high levels of mercury, which can be harmful to the developing fetus. Women should not be worried if they’ve had the odd meal of fish with high levels of mercury. It is only a potential problem when that type of fish is eaten regularly, which causes a build-up of mercury in the mother’s blood. Handle mercury thermometers with care. Or, better yet, replace them. Although the liquid mercury in fever thermometers is less toxic than the form of mercury found in fish, inhaling it can still cause damage to the lungs, kidneys, and brain. In some cities, you may be able to exchange your old mercury thermometer for a free digital replacement. Household hazardous waste collection facilities and many pharmacies also collect and safely dispose of mercury thermometers. If a mercury thermometer breaks, make sure that children do not touch the liquid mercury or inhale its vapors. Carefully sweep the little silver balls of mercury into a disposable plastic container and seal the container shut. Then take the container to your local household hazardous waste collection facility. Do not flush the mercury down the toilet, vacuum it, or throw it in the garbage can. If the spill is on a rug or sofa, it’s best to get rid of the contaminated item. Mercury is extremely difficult to remove from carpets, upholstery, or other absorbent surfaces and will continue to vaporize over time. Leave your silver-colored dental fillings alone, and avoid them if you’re pregnant. Silver-colored dental fillings contain as much as 50 percent mercury by weight and can release mercury vapor especially when they are new or while you’re chewing. Pregnant women, or women planning to become pregnant within a few months, should avoid getting mercury fillings. Swallowing filling fragments poses less risk of harm because metallic mercury, unlike the mercury in fish, is not as easily absorbed in the stomach and intestines. If you already have mercury fillings, most experts agree that it’s best to leave them in place because mercury can vaporize and be inhaled during the removal process. The dentist’s drill can also release small bits of the filling, which can get embedded in cheeks and gums. The most popular alternative to mercury fillings is composite, or porcelain, fillings. However, these fillings contain the hormone-disrupting chemical bisphenol A, or BPA. Gold fillings appear to be the safest alternative but are considerably more expensive. Discuss the benefits and drawbacks of each option with your dentist. Methylmercury from fish eaten by women during pregnancy seems to only pose a health threat to the baby while it is in the womb. Once the baby is born, the levels of mercury in the mother’s milk are not high enough to be a risk to the infant. Limit their child to one serve (75g) per fortnight – billfish (swordfish, broadbill and marlin) and shark (flake), with no other fish eaten in that fortnight. Limit their child to one serve (75g) per week – orange roughy (deep sea perch) or catfish, with no other fish eaten that week. Encourage their child to eat 2–3 serves per week – of any other fish or seafood (for example, salmon or tuna). Fish that contain high levels of mercury include shark, orange roughy, swordfish and ling. Mercury is a naturally occurring element that is found in air, water and food. The unborn baby is most sensitive to the effects of mercury, particularly during the third and fourth months of gestation. Pregnant women, women planning a pregnancy and young children (up to six years) should avoid consumption of fish that contain high levels of mercury. Nearly all fish and shellfish contain traces of methylmercury. However, larger fish that have lived longer have the highest levels of methylmercury because they’ve had more time to accumulate it. These large fish (swordfish, shark, king mackerel and tilefish) pose the greatest risk. Other types of fish and shellfish may be eaten in the amounts recommended by FDA and EPA. If you want more information about the levels in the various types of fish you eat, see the FDA food safety website or the EPA website. Fish sticks and “fast-food” sandwiches are commonly made from fish that are low in mercury. One week’s consumption of fish does not change the level of methylmercury in the body much at all. If you eat a lot of fish one week, you can cut back for the next week or two. Just make sure you average the recommended amount per week.